It seems that as furniture ages, becoming shabby, uncomfortable or outdated, people will delegate those pieces to the basement, dorm, or a son or daughter’s first apartment. They look for new furniture, purchasing by price and style only. In as little as 3 years later, (in one case a year), numerous issues come to light. Fabric may be wearing out, comfort is gone, finishes are very easily damaged, frames are becoming loose, or broken, or drawers become difficult to operate. When telling me about how disappointed they have become with their purchases, they also talk about the much better furniture they used to have. Sometimes the previous furnishings were purchased at a “Quality” store or were handed down by a relative who only bought the best. 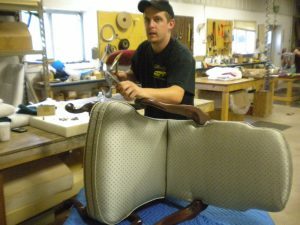 Before you decide to replace existing furniture with new, investigate what you have and how to update it. Our web site has countless pictures of such examples. Don’t get rid of something you later wished you had kept.